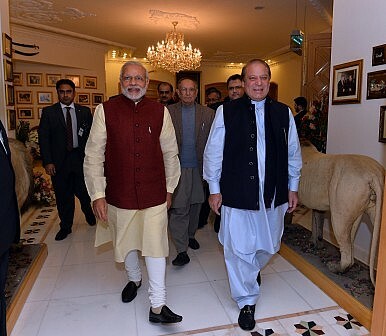 Indian Prime Minister Narendra Modi (left) and Pakistani Prime Minister Nawaz Sharif (right) on December 25, 2015 in Lahore, Pakistan. Indian Prime Minister Narendra Modi’s surprise visit to Lahore on December 25, 2015 was supposed to alter the relationship between New Delhi and Islamabad. The trip was supposed to create a new era of engagement between the two neighbors. However, over the last three weeks, the mood and momentum have changed. The terror attack in Pathankot in the first days of the new year dragged the relationship between the two countries back to square one. The foreign secretary-level talks that were supposed to be held on January 15 have been rescheduled. On Thursday, New Delhi announced that the talks would be held “in the very near future,” but no time frame has been fixed. This is the third time since Modi’s tenure began 20 months ago that talks between India and Pakistan have been postponed at the last minute. The previous two times, talks were abandoned by New Delhi in protest against Pakistan’s engagement with Kashmiri separatist leaders. This time, the Pathankot terrorists have successfully sabotaged attempts at reconciliation between the two neighbors. However, unlike in the past, there is no acrimony, which generally precedes the deferment of the promised dialogue. Both New Delhi and Islamabad are demonstrating a new maturity and understanding. India wants Pakistan to take concrete action against the terrorist groups or individuals who were involved in militant attacks on the Pathankot airbase before talks can proceed. Islamabad is also taking positive steps; it has detained some of the members of Jaish-e-Mohammad (JeM), a group allegedly involved in the attacks at Pathankot. There are some reports that JeM’s chief, Masood Azhar, has been detained by Pakistani police. Pakistani officials have so far refused to confirm the development. Meanwhile, political commentators in India think that the rescheduling of the talks is merely meant as a face-saving gesture for the Modi government. They feel that if Sharif detains the top leadership of JeM, it will give the Indian prime minister some political leeway, which might allow the dialogue process to resume. How successful have India-Pakistan confidence-building measures really been?